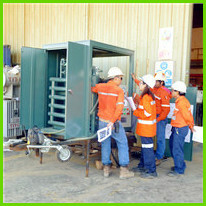 ►We offer on-site training and commissioning service for customers at their workshop site with some reasonable charge. ►We will send two people or three persons team for the commissioning service, one engineer and one translator and technical assistance. ► We will install the machine for customer at their site, and arrange the best connecting way for the machine and other equipment, like transformer, oil tank, etc. ►We will offer professional training service on-site and make sure the customers can operate the machine correctly and maintain the machine well.